We got back yesterday with enough time to pop out for some groceries and prep lunch for the week. Friday's dinner included a raw cauliflower couscous and I was totally inspired to try a raw cauliflower dish. In my opinion, nothing goes better with couscous (or cauliflower 'couscous') then moroccan spices, and nothing compliments the vibrancy of Moroccan flavours better then beautifully plump fresh apricots from the market. In a food processor fitted with the s-blade, pulse the cauliflower until a fine crumb has formed. Transfer to a bowl and season with salt and pepper. In a saucepan over medium heat, saute the oil, garlic and spices until fragrant. Add the orange juice and stir to combine. Reduce heat to low, and add the chickpeas, carrots, raisins and cauliflower. Stir over low heat for 2-5 minutes, until fully incorporated. 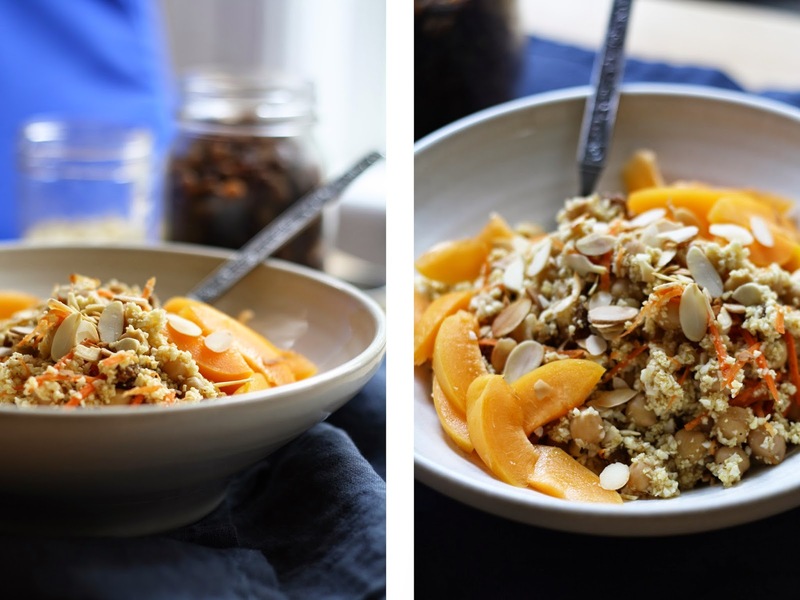 Transfer to serving bowls and garnish with apricot and almond slices. Alternatively, mix the apricots directly into the pan, allow to cool, and store for later. Serve at room temperature or reheated.